Details: This charming and very unusual style portrait is attributed to the circle of Drouais. This beautiful portrait is of a member of the de la Force family, possibly the wife of the 7th Duc. She wears the ermine of a senior aristocrat, yet is in informal but intimate pose, typical of Drouais’ work. 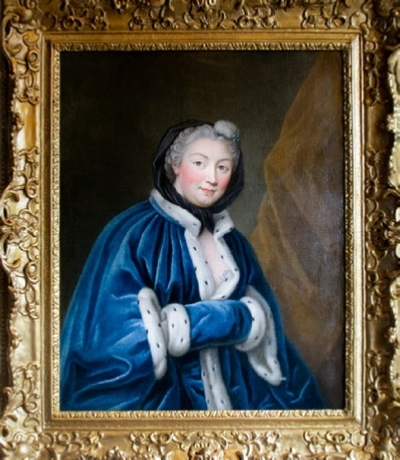 She would have been a close relative of the Marquise de Caumont la Force who Drouais is known to have painted, which adds some weight to the attribution. The Duc was a descendant of Jaques Nompar de Caumont (1558-1652), the first Duc and a Marshal of France. The family had many distinguished soldiers and men of letters over the centuries. The present Duc, the 14th, is Henri-Jacques de Caumont (born 1944), who lives in Portugal and has extensive wine interests. By chance we have a portrait of the 8th Duc, Louis Joseph Nompar de Caumont (1768-1838) who was a general in Napoleon’s army and subsequently that of King Louis XVIII. Its provenance is known to be the family of the Ducs de la Force. Drouais was a major French portrait painter of the 18th century. He studied under Francois Boucher and Carle Vanloo. He was noted for the informality and intimacy of his portraits and painted - amongst many members of the aristocracy - Madame de Pompadour, the children of the Duc D’Orleans and the Marquise de Caumont la Force. As there is no clear provenance to the work, the portrait is attributed only to the circle of Drouais.